Clayton Homes is launching a nationwide campaign to show that manufactured homes are accessible, customizable and efficient. The effort from Boulder-based marketing firm Made—which consists of audio, banners, pre-roll, carousel and billboard video components—will include Facebook, Instagram, Spotify and Pandora as well as broadcast, OTT and Connected TV providers. The company’s goal is to “democratize” luxury and provide attainable home ownership for all families, says Kevin Clayton, CEO of Clayton Homes, which has more than 1,000 authorized home centers around the country. 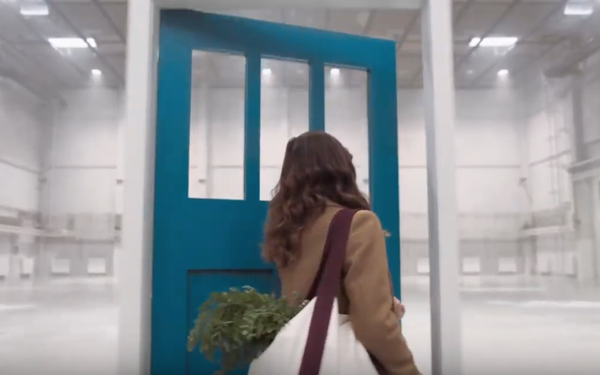 As the 60-second spot opens, a casually dressed young woman walks into a large, empty warehouse which turns out to be a home-building facility. Bit by bit, it transforms into a dream home around her. Walls erect and recede to make room for bookshelves. A sofa is placed under her as she is sitting down and her feet are propped on a matching ottoman. The constantly moving camera follows family members (a pacing husband, a pajama-clad child) roaming through the place as both the home, and a great life, come together. The ad ends with an epic pull-through shot where we discover the home is now in a beautiful outdoor setting, where the family resides. “And just like that,” a title card reads. “A dream life is something you can afford.” The tagline is “That’s Prefabulous. Clayton.” The spot will be cut down to a 30-second, 15-second and 6-second version. According to the U.S. Census Bureau, the average price of a new site-built home with land is nearing $400,000–much higher than what off-site homes sell for. This is the second campaign Clayton has produced in association with Made, its agency of record.